Environment Ministry spokesman Neth Pheaktra said yesterday park rangers from the provincial environment department found the elephant in a cashew plantation. It had been shot about ten days ago. He said the elephant was 2.70 metres tall, 4.50 metres long and weigh about two tonnes. “Examination of the elephant’s body showed it was shot for its ivory,” he said. “The tusks were missing and its tail was cut off. There was a gunshot wound on the elephant’s body. Din Bunthoeun, deputy director of the provincial environment department, said department officials were trying to find the killers, but did not yet have any suspects. The elephant has been buried, but its skeleton will be put on display later for scientific research on the diversity of the lives of elephants in Cambodia. In the last three years, three elephants have died of shooting or of old age. A baby elephant was found dead after being trapped by hunters in the sanctuary last year. “We condemn this illegal shooting for ivory and the authorities are investigating to arrest those responsible,” Mr Pheaktra said. The Environment Ministry is cooperating with partners to establish long-term planning for conservation in protected areas using law enforcement, raising public awareness and protecting the forest and corridors for the elephants. 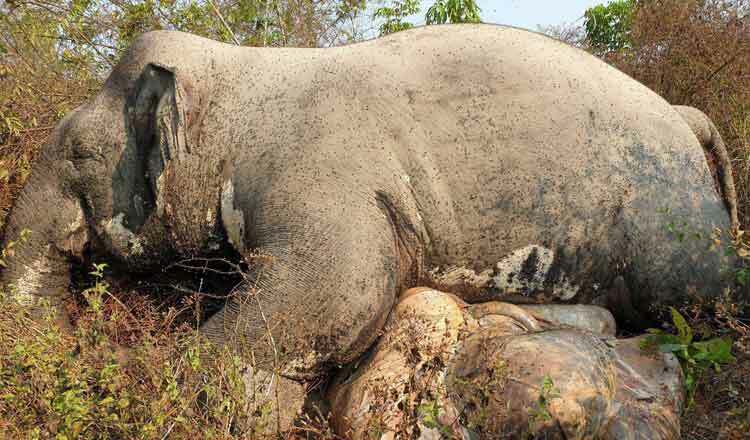 “The ministry wants to call on all people to join in protecting and conserving elephants in Cambodia and avoid killing them,” Mr Pheaktra said. In the protected area in Mondulkiri province, there are an estimated 120 to 170 elephants. Cambodia has about 500 elephants living in rainforests, especially in the northeast and Cardamom Mountains. Mondulkiri provincial Governor Svay Sam Eang.